Plot: Dug must unite his tribe against a mighty enemy in a football match with everything to play for. Cast: Eddie Redmayne, Tom Hiddleston, Maisie Williams, Timothy Spall, Miriam Margolyes, Rob Brydon, Kayvan Novak, Gina Yashere, Richard Ayoade, Johnny Vegas (voices). Aardman at their laugh-out-loud best. If Chicken Run was Aardman’s take on The Great Escape then Early Man is definitely its Escape To Victory. Only here, the plucky Brits are represented by Early Man, Dug, and his plucky clan who are fighting to save their valley from the machinations of evil, Bronze Age conquerers. Along the way, Aardman deliver up the usual mix of pun-fuelled, school-yard humour, and heart-warming story telling. But what makes Early Man such a joy is its determinedly low-tech visuals. Stop-frame claymation is the process that made Aardman’s name but the likes of Flushed Away and Pirates! An Adventure With Scientists seemed to suggest that the company was moving towards more mainstream animation and CGI-polished productions. 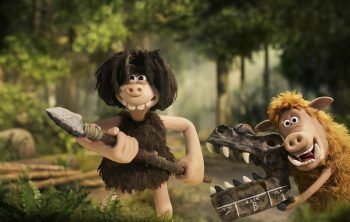 While Early Man clearly does use some CGI, the feel is pure old school Wallace & Gromit. Nick Park himself commented that they were looking for a One Million Years BC, Ray Harryhausen aesthetic, with finger-prints on the Plasticine all part of the design. They’ve succeeded in spades. It’s easy to imagine Dug and his faithful sidekick Hognob as the direct ancestors of Wallace and Gromit, with their fertile valley home (“just outside Manchester”) eventually evolving into West Wallaby Street. Tom Hiddleston delivers a brilliant Python-esque villain, complete with outrageous French accent. Maisie Williams gives us a heroine to cheer for in the shape of football-mad Goona. While Rob Brydon populates the film with familiar voices that will bring both a smile of recognition and chuckles a-plenty. 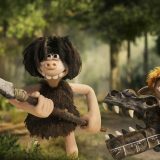 Early Man is Aardman at its very best: silly, irreverent, nostalgic, and great, family-friendly fun.